“I wanted it to be you. It was the perfect afternoon to watch one of my top favourite romantic comedies with two of my favourite actors. I don't need to tell you the title, do I? I love watching it this time of year. I've never been to New York but seeing all those lovely tree-lined streets makes me want to go there. Truth of the matter, most places I haven't visited but want to someday, I'd like to see them in the fall time. 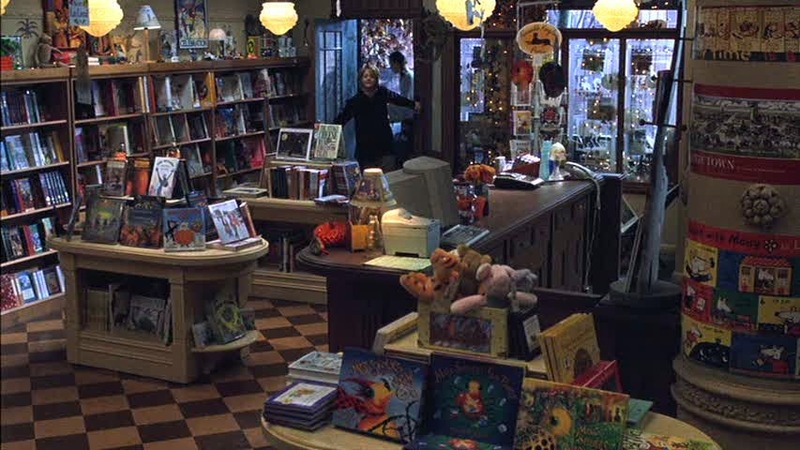 Don't you just love the cozy little bookstore around the corner ... with the twinkle lights and flowers and pumpkins? Not to mention the story-reading corner. 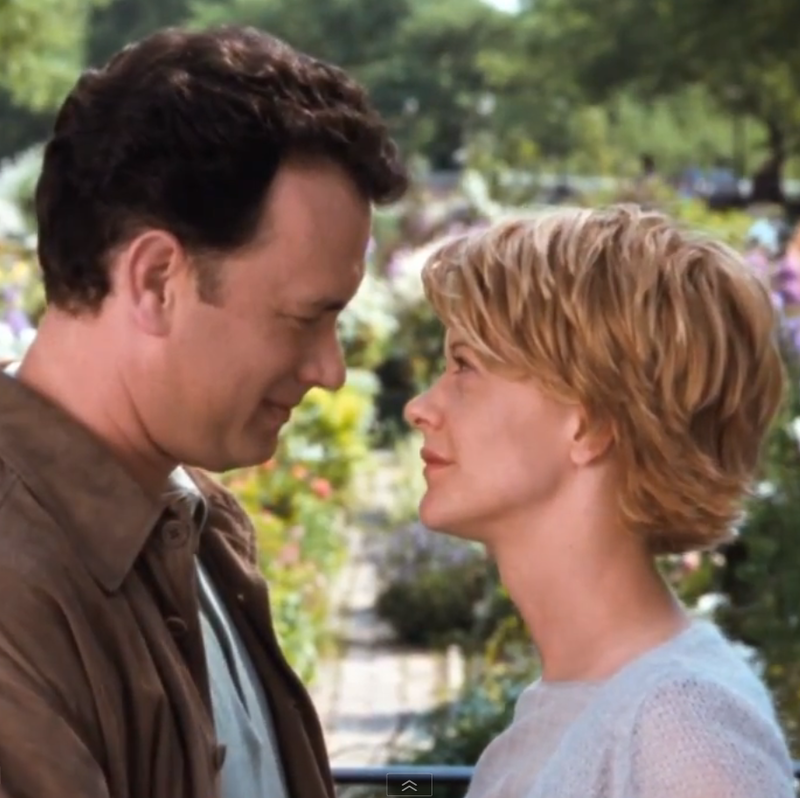 It doesn't matter how often I watch this movie, when I hear Brinkley bark in that last scene and Hanks slowly comes round the corner and she's standing there, I feel this sense of completeness -- mit happy tears. It's life as it ought to be. So that's what I did this afternoon (well, and folded laundry). How about you, what were you up to today? I knew the movie as soon as I saw the first line in my reader. I enjoy that one, too. There's something so romantic about a little bookstore, isn't there? The other line I really like is "Daisies are the friendliest flowers." I worked in the library today, talking with students, covering books, shelving books. I love books. 152 reasons why I love this movie (100 of which are books). I had lunch out today with a friend. Had a serious faith talk. Also collapsed in a fit of giggles. I can give you 152 reasons why women "my age" should not indulge in public displays of giggles, and we ignored every one of them. The movie is one of my favorites as well. Tom Hanks is such a versatile actor, good at everything he is in. I finished a bit of housework, then when I finish my blogging session, we are off to an afternoon of football with my grandson. They are still playing touch football, so don't know how I'll feel when he dons a helmet and shoulder pads. Such a good movie, with books and a happy ending. Just ordered bookshelves,btw. As much as I am minimizing in other areas of my life, I want to live in a library/bookstore! Brenda, we are both mentioned in a recent blog post by Fiona at her blog How to be Chic (my post about minimalist closets and your comment). I got a lot of traffic from it. Check your stats, you might have too.